The term LeFort fractures is applied to transverse fractures of the midface. Rene' LeFort described three transverse weak lines through the midfacial skeleton as a result of his cadaver studies in 1901. Le Fort I level fractures are essentially a separation of the hard palate from the upper maxilla due to a transverse fracture running through the maxilla and pterygoid plates at a level just above the floor of the nose. LeFort II fractures transect the nasal bones, medial-anterior orbital walls, orbital floor, inferior orbital rims and finally transversely fracture the posterior maxilla and pterygoid plates. 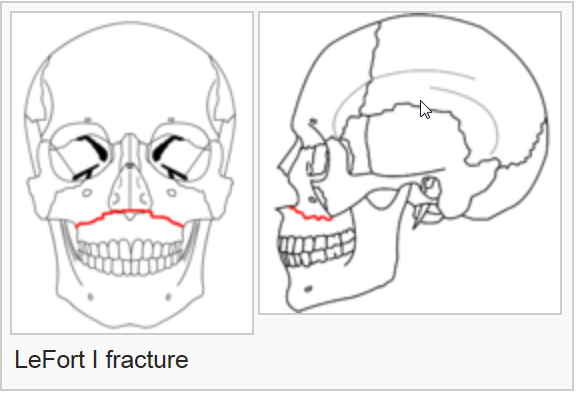 LeFort III fractures result in craniofacial disjunction. This is the highest level LeFort fracture and essentially separates the maxilla from the skull base. The fracture is a transverse separation of the nasofrontal suture, medial orbital wall, lateral orbital wall or zygomaticofrontal suture, zygomatic arch and pterygoid plates. Within the posterior orbit LeFort III fractures may pass through the inferior or superior orbital fissure and in rare situations through the optic canal. It is recognized that many fractures depart from the defined classic fracture descriptions. If more than one LeFort fracture exists the fractures are named from the highest downward, i.e. LeFort III - II or III - II - I. LeFort fractures transversely disrupt the important nasomaxillary and zygomaticomaxillary bony facial buttresses in essentially all cases. LeFort fractures most frequently result from high-speed deceleration crashes in which the midface or maxilla strike a stationary object (dashboard, pavement). These injuries may also be produced by striking the face with a rigid object (tire iron, baseball bat). Forces directed at the midface from straight on tend to cause LeFort I and II fractures. If the force is directed slightly downward a LeFort III fracture more frequently results (33). 1. Visual acuity and ocular exam. 2. Occlusion, look for anterior open bite and midfacial mobility. 3. Carefully inspect the dentition, remove any dental fragments from the mouth. 4. Bony facial symmetry and palpable step off's in the nasal dorsum, inferior orbital rims, zygomaticofrontal suture area and zygomatic arch. 5. Cranial nerve V2 sensation. Airway patency must be addressed promptly. If the airway is compromised or associated injuries dictate the need for assisted ventilation the best way to secure an airway is with a nasotracheal intubation over a flexible bronchoscope or with a tracheostomy. If the patient has associated mandible fractures, oral airway competence may be tenuous (if not at the time of admission then likely in several hours) and plans for a tracheostomy should be made. The patient will likely need a tracheostomy for definitive treatment in any case. If the patient is being taken to the operating room emergently for other injuries, that is frequently an opportunity to at least perform a tracheostomy and intermaxillary fixation if the definitive repair of the facial fractures cannot be done at that time. In cases where some time will pass (7 - 10 days) before the patient can be taken to the operating room for definitive fracture fixation, intermaxillary fixation or stabilizing circumdental ligatures (Ivy loops) should be placed to stabilize the major palatal fragments and restore the patient to as near normal occlusion as possible before the fracture lines begin to granulate and become difficult to mobilize. This can often be done at the same time as the tracheostomy. Ideally intermaxillary fixation should not be placed before the patient has had a CT scan, the metal will greatly reduce the quality of the CT. Antibiotics with anaerobic and strep coverage should begin at admission. Violated mucosa over associated mandibular fractures or blood in the sinuses of Le Fort fracture patients may result in infections which could delay or compromise definitive treatment. Facial films may be adequate to make the diagnosis, however they frequently lack the details of orbital and palatal involvement seen on the CT. If a CT scan is going to be obtained most routine facial films will add no further information. The CT scan to be ordered is a non-contrast, fine cut (2mm sections) scan with axial cuts from the skull base to the mandible. If orbital involvement is suspected coronal sections through the orbits or coronal reconstructions should also be obtained. The main purpose of obtaining coronal cuts is to visualize the orbital walls. Three dimensional reconstructions are useful for teaching purposes but really have no place in the clinical management of routine fractures. The definitive management of all LeFort fractures centers around the restoration of functional occlusion and reconstruction of stable bony facial contour. The restoration of preinjury or functional occlusion requires that the tooth bearing segments be aligned with the dentition secured into the desired occlusion using some form of intermaxillary fixation prior to rigid fixation of the maxillary segments. This ensures a centric relation and establishes the level of the occlusal plane. Establishing stable bony facial contour requires reconstruction of the anterior midfacial buttresses, and in many LeFort II and III fractures accurate reduction of comminuted zygomatic bones and nasal bones. At the present time the most common way of internally fixating fractures of the midface is with small plates and screws. Every effort should be made to apply the plates axial (parallel) to the nasomaxillary and zygomaticomaxillary buttresses. This orientation at 90 degrees to the major occlusal forces is biomechanically the most favorable position for midfacial plates (34). Wire ligatures are used in some situations however they do not provide the stability afforded with plates and are of little use if the fractures are severely comminuted. Once the tooth bearing segments have been aligned with intermaxillary fixation and these segments have been rigidly fixated with plates and screws, the intermaxillary fixation can frequently be removed. This is a major advantage of internal fixation as it allows oromandibular functioning immediately and airway management in the absence of intermaxillary fixation in much simpler in the multitrauma patient. It should be made clear that not all LeFort fractures require internal fixation, particularly minimally comminuted LeFort I fractures in patients with a full complement of dentition. In this type of situation the major concern is perfect realignment of the dentition. If the zygomatic bones are not involved facial form has been disrupted only by the vertical malposition of the fractured maxillary segment which is reduced with the intermaxillary fixation. If intermaxillary fixation alone is used to manage LeFort fractures it is generally left in place for 6 weeks. Patients must be shown how to cut the intermaxillary wires should an emergency arise and they should have a pair of wire cutters when they leave the hospital. There are several common incisions for exposure to LeFort fractures which are to be internally fixated. The sublabial incision exposes the anterior maxilla and is often the only incision required for LeFort I and some LeFort II level fractures. If exposure of the orbital floor and malar area is required subciliary or transconjunctival incisions are used. 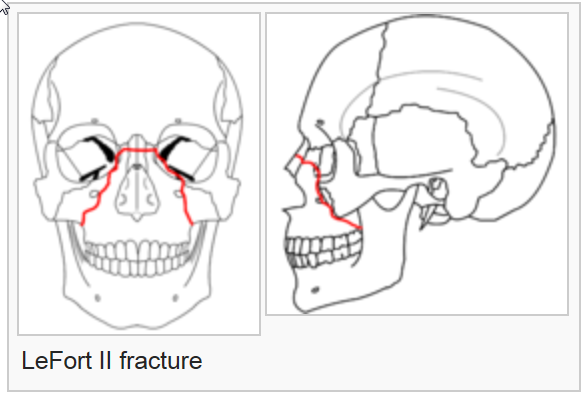 In LeFort III fractures exposure of the superior aspect of the lateral orbital wall and occasionally the zygomatic arch will require a brow incision and rarely a temporal approach through a hemicoronal incision will be used. The surgical management of LeFort fractures using internal fixation proceeds in a step wise fashion. First, occlusion is restored with intermaxillary fixation. If needed the Rowe disimpaction forceps are used to mobilize the maxillary segment. This is followed by exposure of all fractures. In most cases a sublabial incision is made to visualize the anterior maxillary fractures. If needed fractures of the orbital rims are then exposed using one of the approaches listed above. Once all fractures have been visualized fixation is begun by plating to the most superior stable bone and working downward. Care is taken to try and align plates axial to the anterior buttresses. Ideally one plate is placed across the fracture overlying each of the anterior buttresses. Occasionally, only one nasomaxillary plate can be placed due to bone loss or the root of the canine tooth interfering with plate placement on one side. In all cases a plate should be placed over both zygomaticomaxillary buttresses. If a fracture crosses the inferior orbital rim this is also plated. 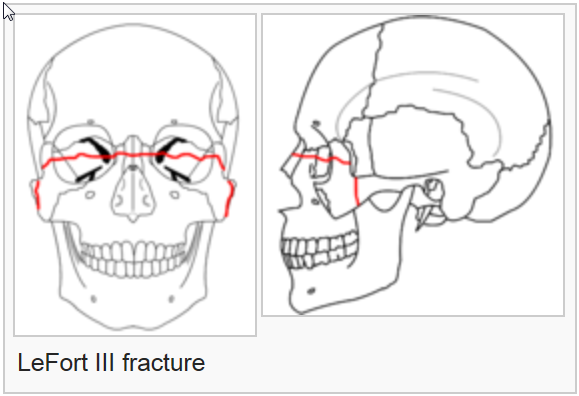 Associated fractures of the orbital floor are usually addressed following the stabilization of the major bony fragments. A detailed description of orbital fracture repair will be given in that section. After all fractures have been stabilized the intermaxillary wires can be removed and the patients occlusion checked. The patient should range into occlusion easily. I prefer to leave the arch bars on for one to two weeks in case training elastics are needed for any occlusal disharmony that becomes apparent. Titanium and vitallium plates and screws are not removed. Stainless steel plates and screws, very rarely used, should be removed after 6 to 12 months.